This code is compiled using either the default tree implementation or the ‘multigrid’ regular Cartesian grid implementation. We use a square, regular, Cartesian grid and vary the resolution from 162 to 20482 (to check for the influence of memory caching). We fill a with a simple function. We set a number of loops proportional to the number of grid points so that times are comparable on all grids. Here we compute b=∇2a using a 5-points Laplacian operator. Something simpler: the sum of a over the entire mesh. And finally the restriction operator. 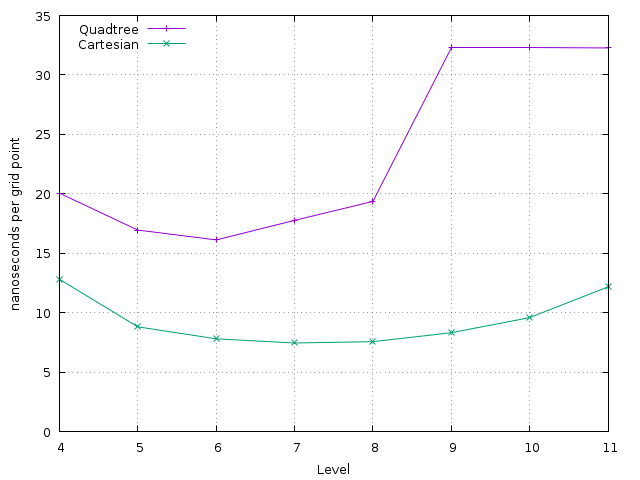 This graph shows the speed of the tree implementation for each operation relative to the speed on the Cartesian mesh. As expected, the overhead is relatively larger for the simpler operations (e.g. sum of all elements). This graph is quite sensitive to the exact machine architecture (cache hierarchy etc…). 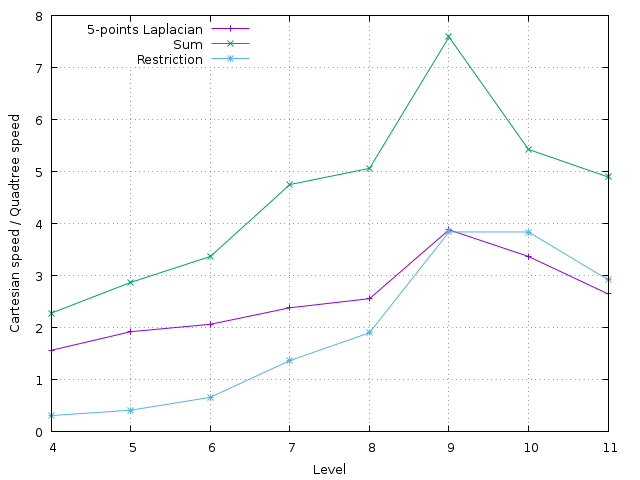 The absolute speed for the Laplacian operator on both grid implementations is shown below. Note that Cartesian meshes are fast! (i.e. hundreds of million of grid points per second).